This week, I will be leading a Native Plant School class on “How to Establish a Buffalograss Lawn“. Though the time to plant buffalograss is still months away, winter is the time to start thinking about how your lawn might benefit from a switch to buffalograss and what steps you need to take to prepare. 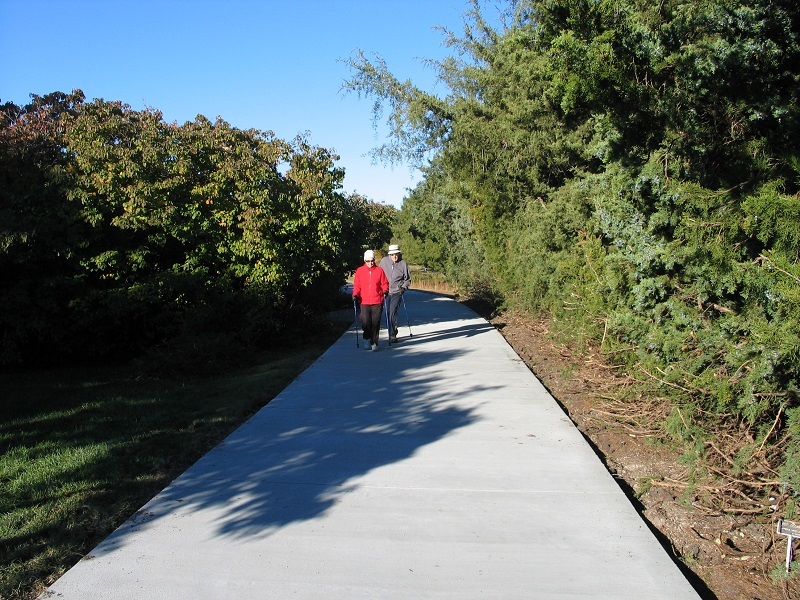 The Arboretum has benefited from the established stands of buffalograss we maintain. The fine leaves stay a nice blue-green during the growing season, and it requires less mowing, watering, and fertilizing compared to our fescue or bluegrass lawns. Newer varieties of buffalograss (Bowie, Cody, and Sundancer) green up faster in the spring, stay green longer in the fall, spread quickly by stolons to cover a planting area and remain shorter. They therefore require less mowing. Once established, we have found it to be a tough, durable alternative to many cool-season grasses. It thrives in dry, sunny conditions and even survived the extreme drought of 2012. We will be planting some additional areas to buffalograss in the coming year. Buffalograss needs at least 6 hours of direct sunlight per day and a well-draining soil to grow best. It will not grow well in low areas with periodic standing water or areas of moderate to heavy shade. Typically, if it is unhappy, you also will be unhappy with its overall appearance. Weed control prior to planting. Just like establishing a flower bed, your seeding area needs to be as weed free as possible. I have found that several applications of Round-Up in the spring prior to planting is the best way to control weeds, especially Bermuda grass and bindweed. I also lightly till (1/4-1/2 inch deep) the area before planting so that I have some loose soil to just cover the seed. Keep in mind that every time the soil is tilled new weed seeds will germinate, which will need to be eradicated before spreading the seed. There are new forms being discovered and introduced every year, but the forms we have used at the arboretum have been Cody, Bowie, and Bison. We seeded them in June or July at a rate of 2-3 lbs. of seed per 1000 square feet. Buffalograss needs soil temperatures that are above 60⁰ F for germination to start. I normally spread half the seed in one direction and then spread the other half perpendicular to the first half of seed. I lightly rake the area and then pack it in (drive over entire planting with a mower or tractor) to get good seed-to-soil contact. I water the whole area deeply the first watering to completely saturate the soil (just to the point water is running off) and then follow with frequent light watering until the seeds germinate in 14-21 days. Once germination is complete, infrequent deep soakings will keep the new seedlings spreading. 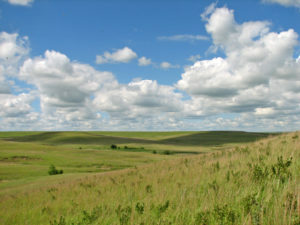 Full establishment of an area from seed can be completed in the first year. These new forms of Buffalograss perform well in our area. 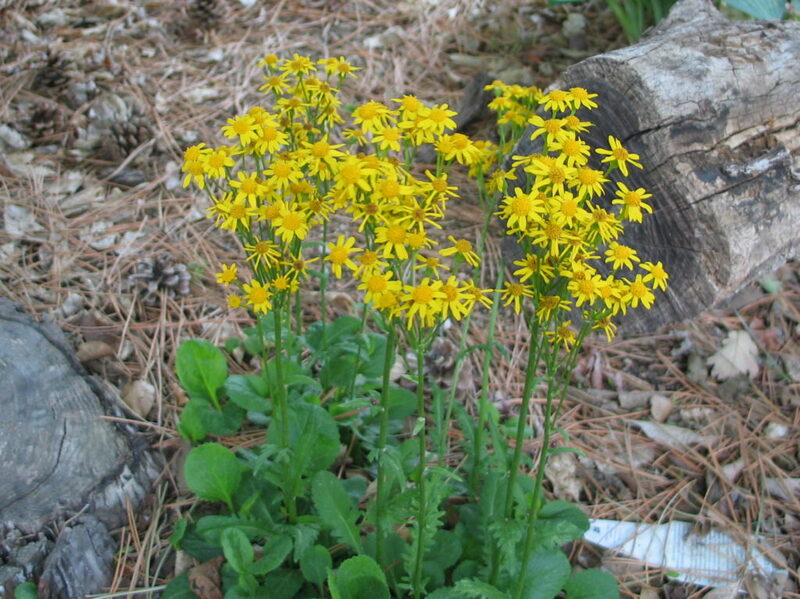 In ideal conditions, they form a thick, dense lawn that can out compete weeds. In marginal situations, weeds can become problematic, requiring weed control through herbicides or manual eradication. We apply a broadleaf weed control in the fall to eliminate henbit, dandelions, bindweed and other broadleaf weeds. Management of weeds in your buffalograss both before planting and the first few years after establishment will, over time, reduce future weed control, watering, mowing and overall maintenance. 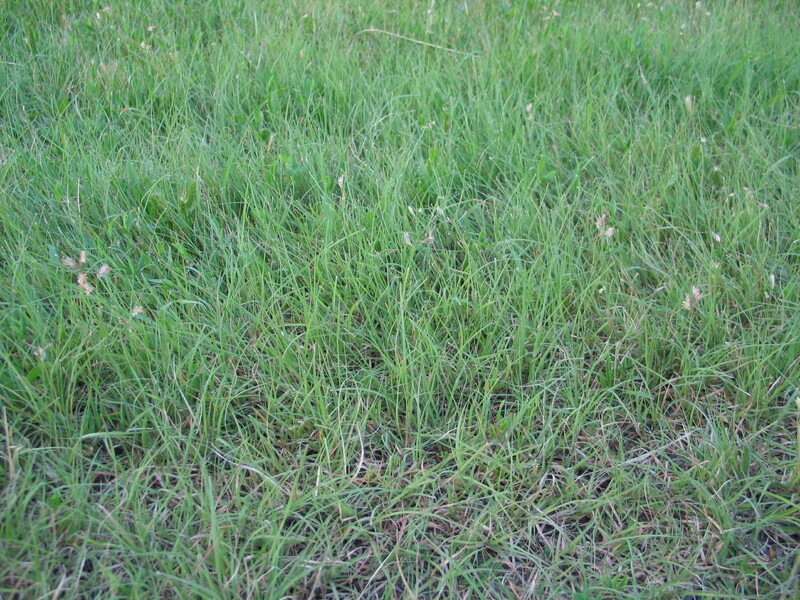 I have found buffalograss to be a valuable turf for open, sunny spaces, but keep in mind that it is not a miracle grass that can solve all your lawn problems. 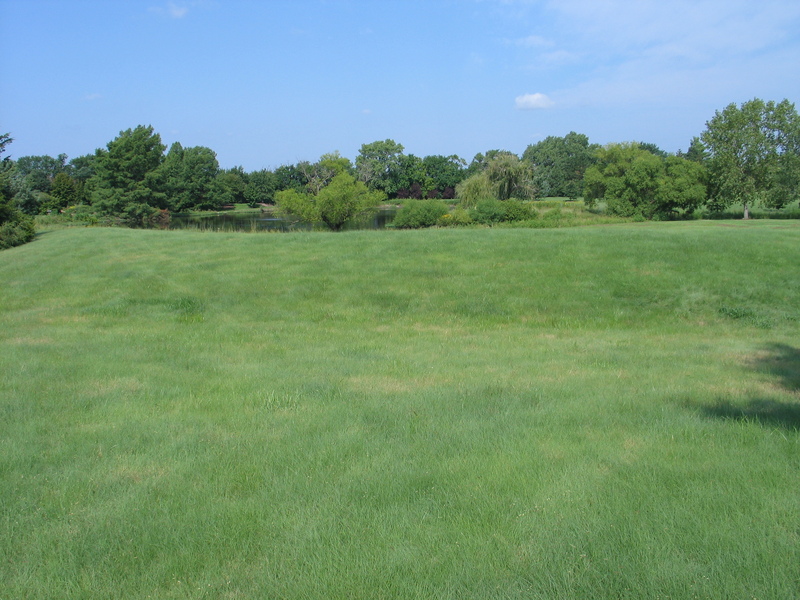 The natural look of this native grass should be appreciated because it is adapted to our area. It should also be planted with the expectation that over time, it will require less financial input and minimal work to maintain a dense, attractive turf. For these reasons, I have found buffalograss to be a low-maintenance lawn alternative that is worth growing. Gardening is a learning process. I have been working at the Arboretum for nearly 25 years and I am still learning new things. 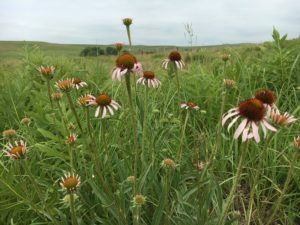 Wildflowers and grasses, as it turns out, live in communities. They grow best surrounded by plants that coexist well and rely on each other. My designs have focused on individual plants grouped together for dramatic effect, but they would be much happier bunched with native grasses like little bluestem. 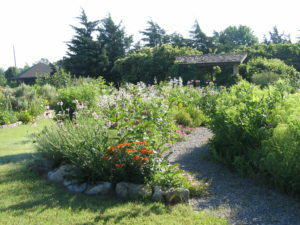 It is a subtle change in design approach, but can make a tremendous difference in the overall success of the planting and give plantings a much richer sense of place. Another epiphany has come with the realization of the trade-off that plants make in the landscape. We tend to automatically believe that just because we put a plant in the landscape it will be happy. I have killed my share of plants by making this assumption. We manipulate the soil and install irrigation with the hopes of keeping the plants chosen for the site alive and thriving. 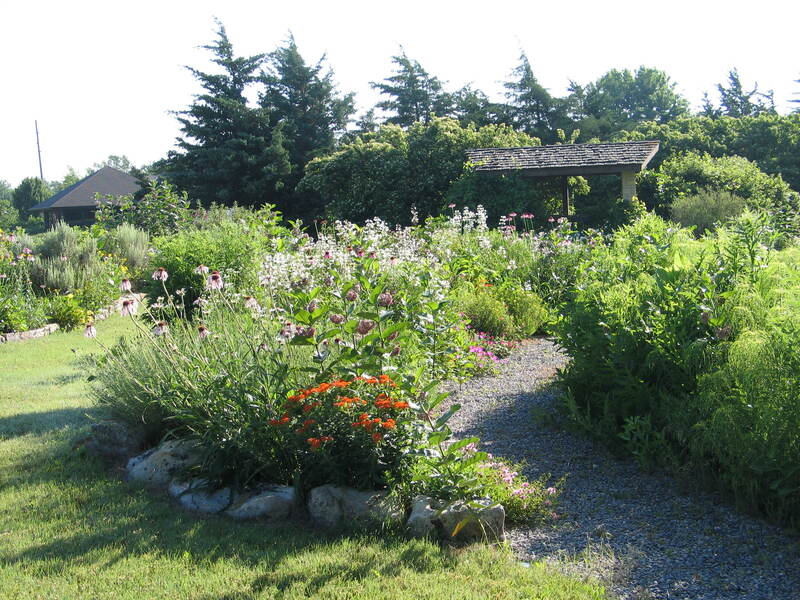 Instead, we should be searching for the right plants for the landscape that do not have to be coaxed to grow. Although there are thousands of plants available, only a select few will grow freely under these specific conditions. This is the trade-off. Plants cannot move and are bound to where they are planted. They have to survive in the soil, light, nutrients, water, pH and temperature of that particular site. They have to tolerate these conditions to grow and reproduce. If any of these resources is lacking in any way, the plant will give up something to continue to grow. The leaves will curl, plant growth will be stunted, flowers will be smaller or if it needs more light, the stems will be elongated. The plant is not growing as it should because it lacks one or all of these important resources or conditions. Our natural response as gardeners has been to supply these resources by changing the conditions, which keeps these plants on life support. I have come to realize there is an alternative. The importance of matching plants up with the site is vital to the success of the landscape design. There are plants that thrive in our gumbo clay soils here in Kansas without organic matter amendments. For centuries, plants with deep roots that can punch through the dense soil for extra moisture have prospered without supplemental help. Think of the landscapes and gardens we love. They seem to thrive effortlessly. They have constraints and can be harsh, but they are lush and beautiful too. They create a sense of place and thrive regardless of the conditions. Stress on plants helps define what will grow in a particular landscape. It makes us choose wisely the plants that we incorporate into our designs. As you plan for spring and begin to choose plants, be conscious of the land. Ask yourself what plants will thrive in this garden? What plants were not happy last year? 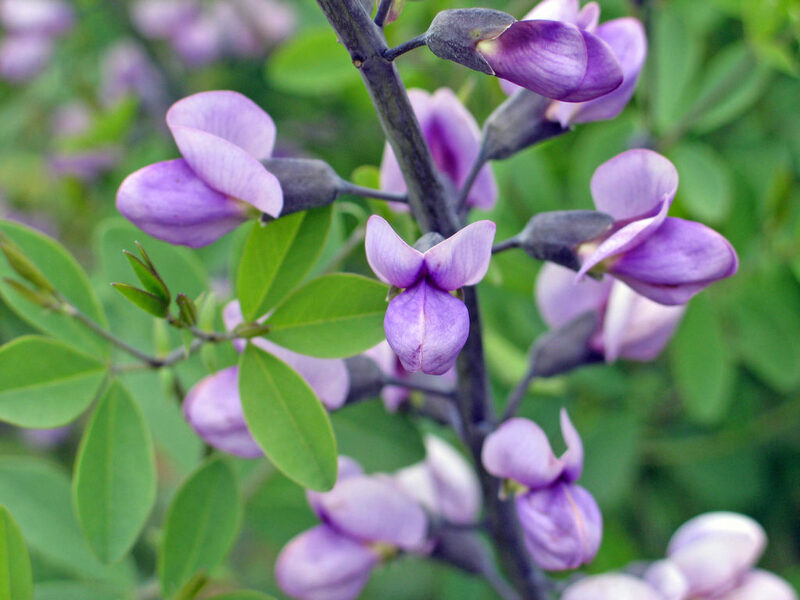 Make a concerted effort to understand the plants you specify for your landscape. As I have said time and again, match the plants up to your site. I just have to take my own advice. If you are looking for a few plants for your area, find them at the 2018 FloraKansas Plant Sale. 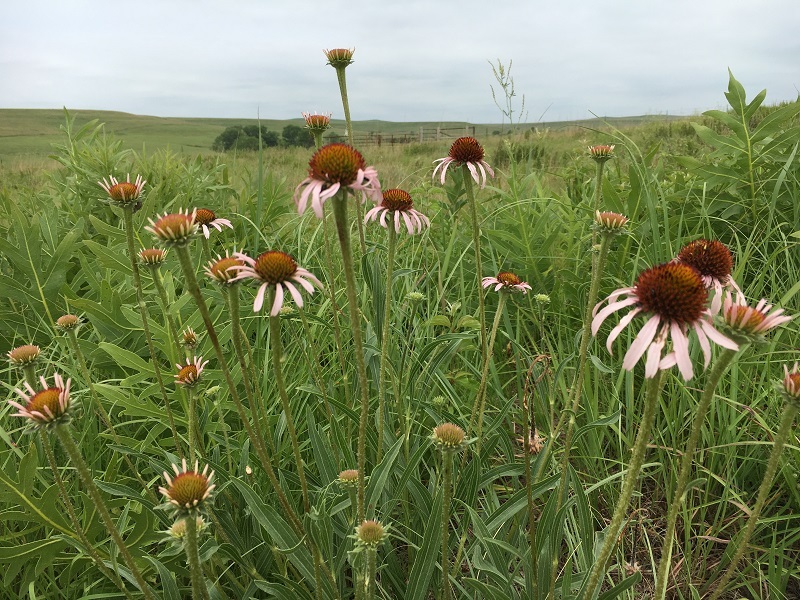 Our FloraKansas Plant Sale is the largest native plant sale in the state of Kansas. 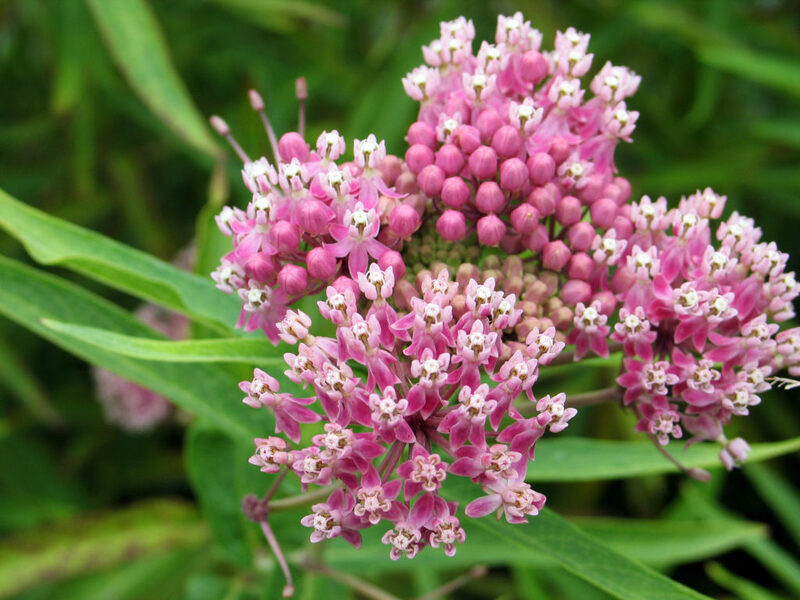 We do our best to provide a wide selection of native and adaptable perennials that will grow reliably, but will, over time, use less water and fertilizer. 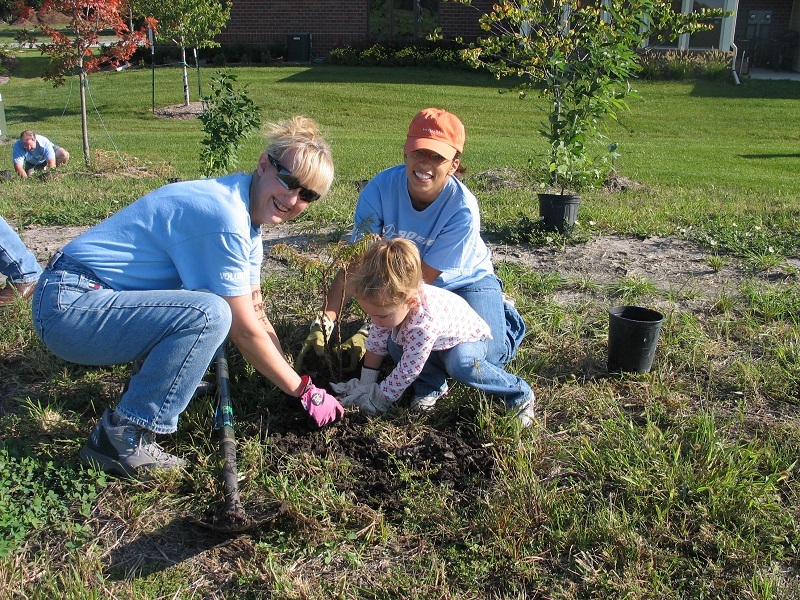 Using native plants in your landscape helps to build back some of the native habitat that our cities and neighborhoods have paved over and shoved aside. While planning out our inventory for this year, I was struck by how many amazing North American natives we offer that get overlooked. Why are these dazzlers not flying off the shelves? I’d like to introduce our readers to some of these lesser-known native showstoppers. 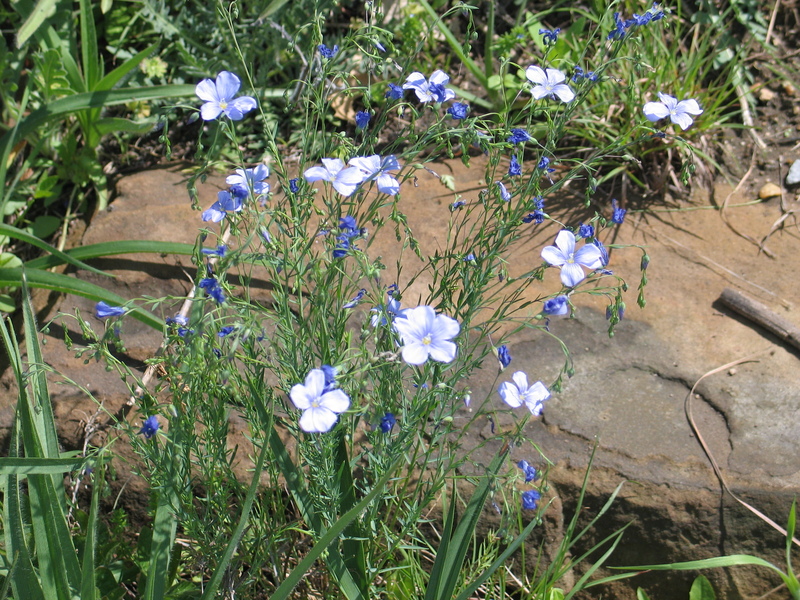 Linum, also known as blue flax, prairie flax, or Lewisii flax (named for Meriwether Lewis) is one of the few “true blue” flowers out there. 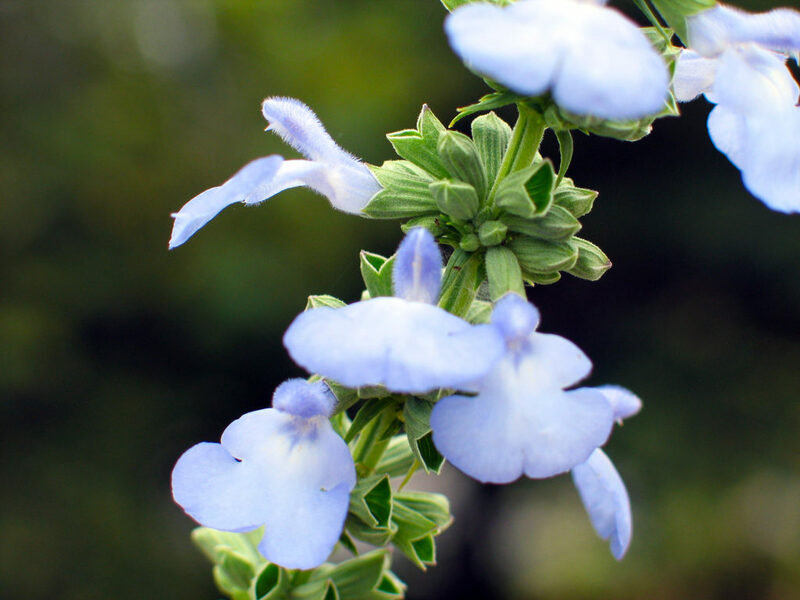 It has dainty blooms on stout stems and thin, grey green foliage. According to the USDA link, it is native from Kansas to California and Texas all the way to the far reaches of Northern Canada. Linum does not tolerate prolonged wetness; good drainage and a somewhat rocky environment suit it well. At the Arboretum, we have a very old blue flax specimen growing out from between a couple of limestone slabs in a rockwall. It blooms every spring like clockwork! Flax is a great native addition to any dry, full sun garden. 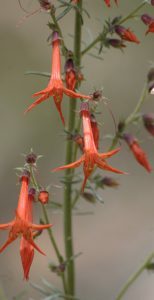 Beloved by hummingbirds, scarlet gilia is a dry-loving plant, native to the western half of North America. Just missing the western Kansas border, this plant makes its home in Colorado, Utah, New Mexico and California – you can tell from that list that it likes a high-and-dry soil climate with excellent drainage. Gilia will likely do well in a sunny rock garden. Scarlet Gilia has dainty red blooms but a tough, drought tolerant root system. Native from Kansas all the way to the Atlantic ocean, this woodland species is a colorful ground cover that spreads via seed or rhizome. It appreciates a shaded location, but is very low maintenance once established. Usually blooming mid-spring, it is a welcome sight for hungry pollinators! Bright yellow flowers of Packera obovata, great for cutting! 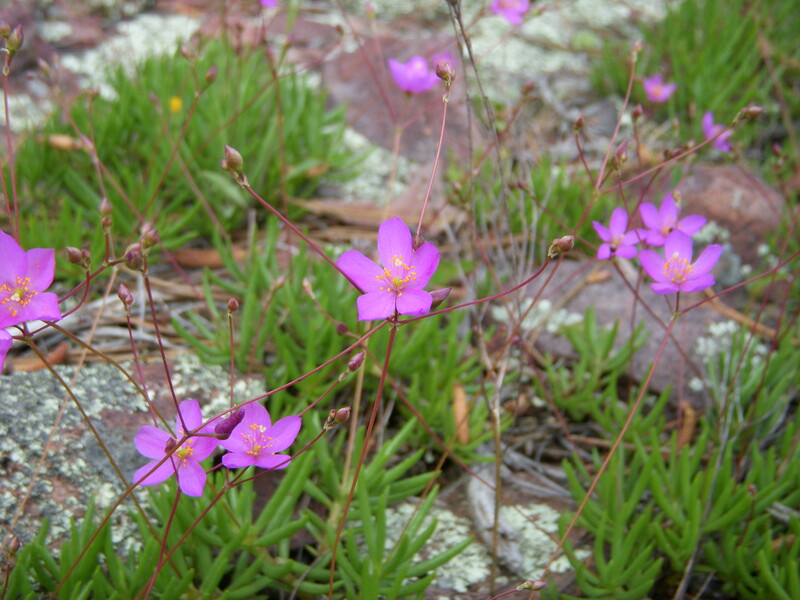 Rock pink, also known as fameflower, is a sweet and petite succulent that loves hot sun. Native from Nebraska to Texas and Colorado to Missouri, this species loves rocky, gravelly soil and dry conditions. Brilliant purple flowers contrast with bright yellow stamens in the center. These look great next to low growing non-native companions such as hens and chicks, annual rose moss or ground-hugging sedums. Found mostly east of Kansas in Missouri, Kentucky, Indiana and Michigan, celandine poppy is a cheery yellow spring bloomer that often goes dormant during the hot summer months. 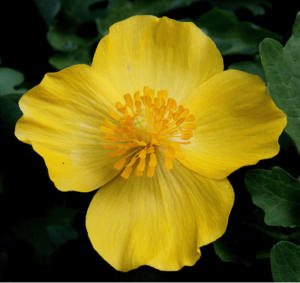 It has lobed leaves and hairy stems which support large, yellow, poppy-like flowers. Okay, so this isn’t a blooming show stopper, but it is a must-have nonetheless! 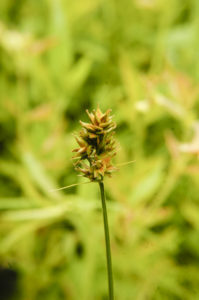 The weedy, invasive sedges give a bad name to the genus, but Carex brevior, and many other well-behaved sedges are superb for filling in gaps in the garden, creating a lush, verdant look. 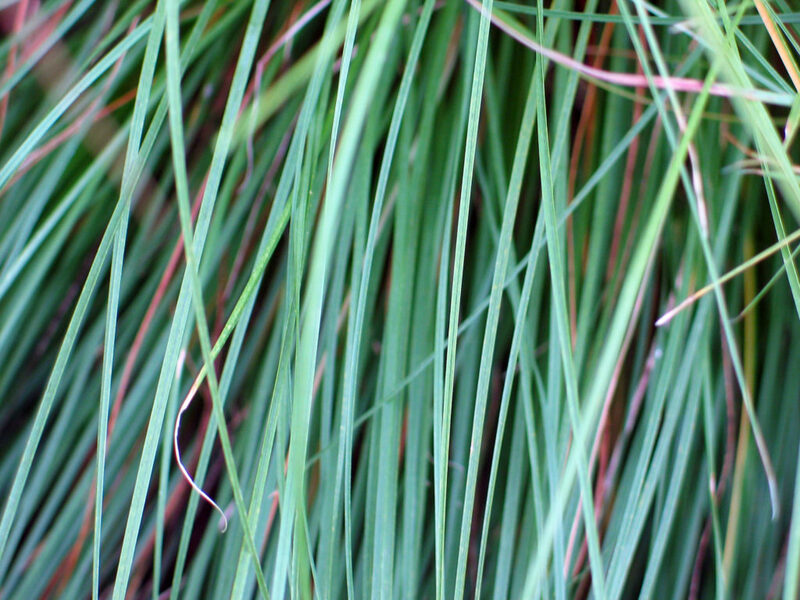 Deep green arching blades and a compact form make this sedge a hit in a part shade setting. Chocolate flower is one of my personal favorite natives. It truly smells (and tastes?) like chocolate, a unique and tantalizing scent for your garden. 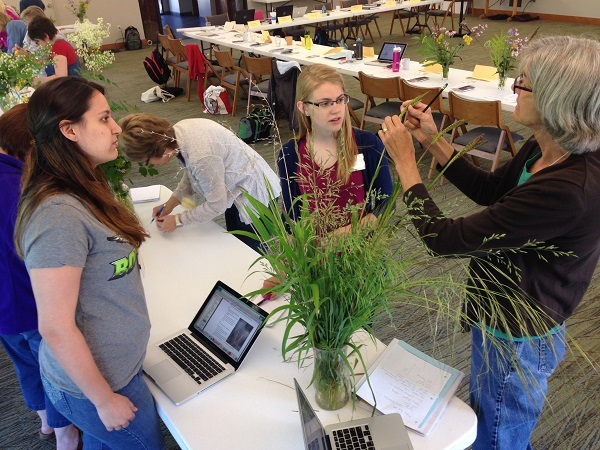 Plant in large groups to maximize the visual impact and aroma. 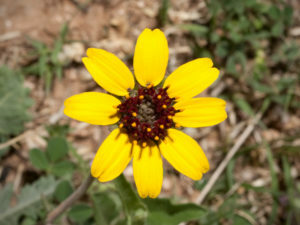 Also known as greeneyes or chocolate daisy, they are beneficial to pollinators and can grow in dry, shallow soil. They are native to Kansas, Oklahoma, Colorado and New Mexico. Spring is just around the corner – soon our greenhouse will be bursting with all these species and many more! Not sure how to incorporate these plants into your garden? 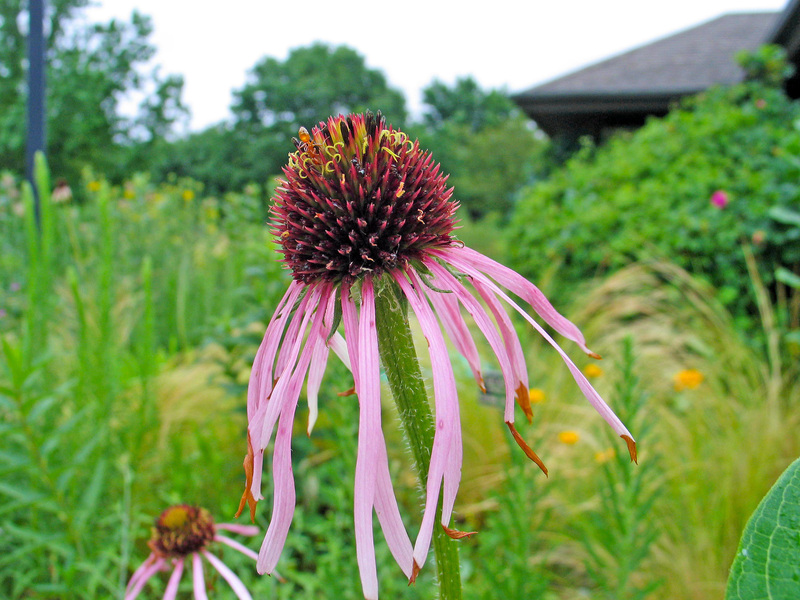 Come to our Native Plant Landscaping Symposium to hear about the experiences and techniques of native plant gardening from beginners and veterans alike. I hope to see these beauties in more landscapes soon, for their own uniqueness and for their contribution to the ecosystem. Do you Need a Prescription for Nature? There is a growing field of study among doctors and researchers on the positive effects nature has on us both physically and mentally. 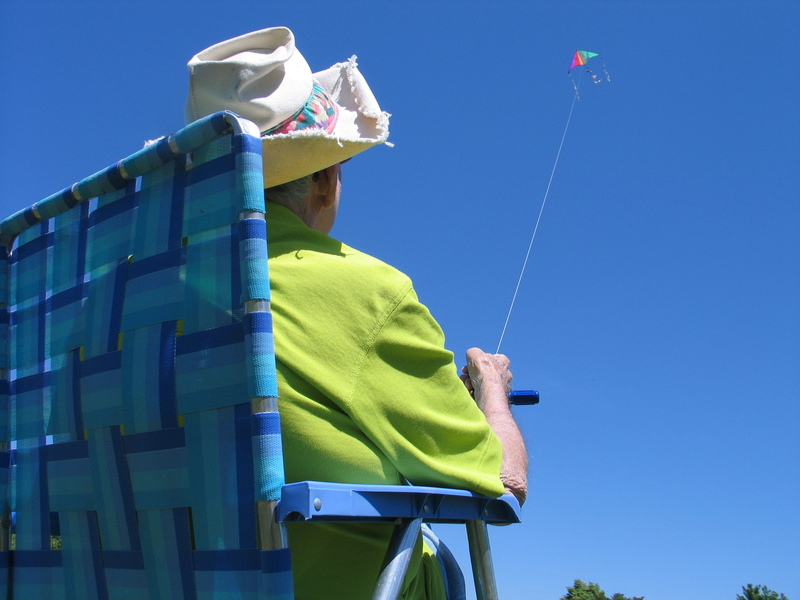 Ecotherapy is the name given to a wide range of treatment programs that aim to improve your well-being by participating in outdoor activities in nature. Spending time outside on a walk or listening to the birds in the trees, taking in the grandeur of the mountains or the beauty of a flower in your garden or the scent of dewy petrichor after an afternoon rain have healing qualities. As we have fewer and fewer encounters with nature and spend more and more time busily working or glued to our electronic devices, the world is passing us by. We are missing out on these connections that we know are important, but do not make time for in our busy schedules. The need for time in nature is so great that some doctors are writing prescriptions for time outdoors. No really – THEY ARE! Richard Louv in his 2005 book, Last Child in the Woods, coined the phrase “Nature Deficit Disorder,” which describes what happens to people who don’t spend enough time outdoors. This book was one of the motivations to start the Arboretum’s Earth Partnership for Schools program that exposes school children to nature, particularly the prairie. According to Louv, children who have these regular up-close, hands-on encounters with nature are less likely to suffer childhood obesity, depression and attention deficit hyperactivity disorder (ADHD) and are more likely to improve academic performance. 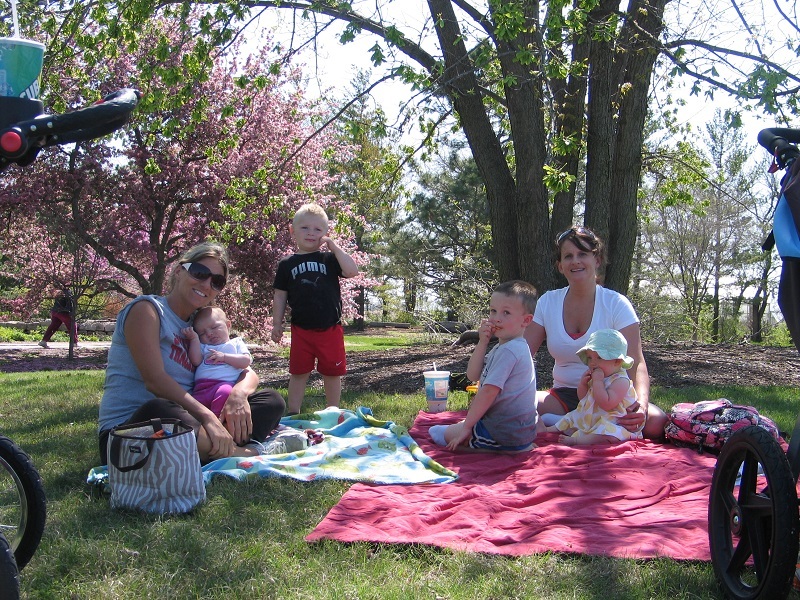 Developing a connection with nature and environmental understanding are fundamental to the psychological and physical health of children. Like kids, adults also need to have these connections. Research shows that people are attracted to and feel restored by elements from nature such as running water, grasses moving with the gentlest breeze, open green spaces, forest trails, birds, butterflies, and other nature-based experiences. I am not a doctor and I know that for many people with chronic mental and physical illnesses, much more than a stroll in the park is required for treatment. However, I know for me, on some days even a short walk during a stressful time can change my perspective and mood. Try it! Find a quiet spot outdoors and spend some time in meditation and journaling. 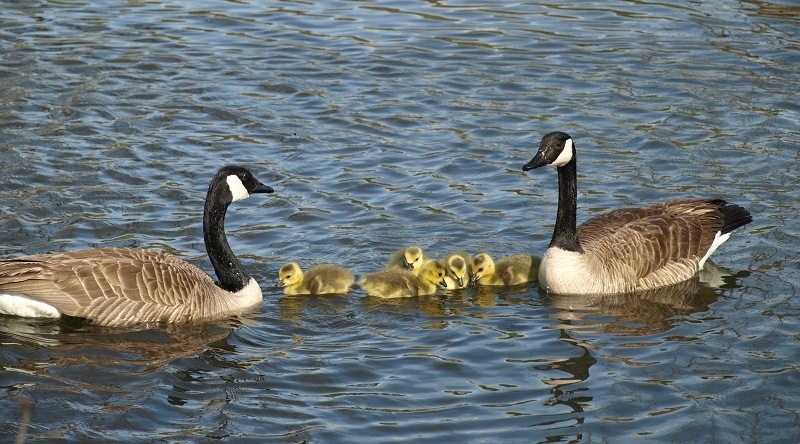 The slower pace and time of reflection can reduce stress and anxiety. Spend time outdoors doing exercise and stretches to improve flexibility and improve your sleep. 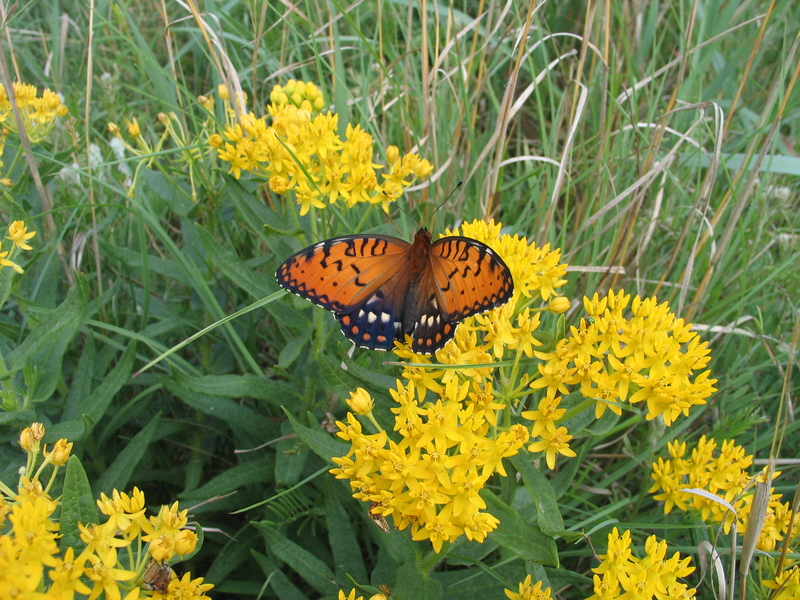 Design and plant a wildlife habitat garden. Be sure to plant a manageable space that you can enjoy. Sit around the fire pit and roast s’mores while visiting with friends. Visit a National Park this year. The bottom line: nature is good for what ails us. Time outdoors calms us, brings balance into our lives and connects us to the world around us. What better reasons could there be to intentionally spend more time outside this year? Open the door and go for a walk!